Anafiotika is a lovely, quirky hidden neighborhood within the Plaka neighborhood of Athens, located beneath the northern slopes of the Acropolis. 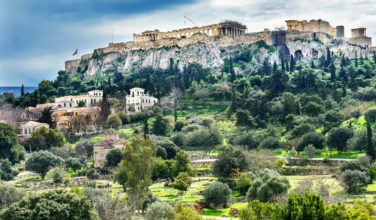 It’s one of the oldest settlements in Athens and is a nice escape from the busy city streets. Anafiotika was built and colonized in the 19th century by tradesmen from the Cycladic island of Anafi. They were brought to Athens after the War of Independence to build King Otto’s palace. Because they missed home so much, they decided to re-create it and called this new neighborhood Anafiotika or “little Anafi”. Homes are all whitewashed, island-style and dome-topped within a maze of tiny passageways. The island craftsmen ignored the decree declaring the area an archaeological zone and built their homes anyway. They took advantage of an Ottoman law that stated that if you could put up a structure between sunset and sunrise, the property was yours and the authorities could not tear it down. 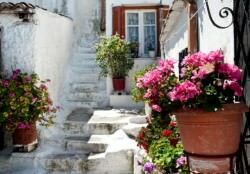 Visitors can enjoy a leisurely stroll through the narrow paths of Anafiotika that are lined with flowers. 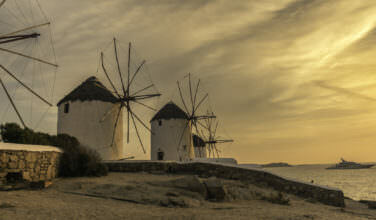 The typical Cycladic village atmosphere makes it seem as if the big city is far away. Whitewashed houses with pots of basil on the windowsills and wandering cats are common sights to be seen. It’s a transplanted Cycladic world where posters of the sandy beaches of Anafi can be found hanging throughout the tiny village. Beautiful geraniums and marigolds can be found on the balconies and rooftops of these buildings providing a serenity that can’t be found in modern day Athens. Two 17th century churches bound Anafiotika. Agios Georgios tou Petrou can be found to the east. It has a tiny courtyard filled with flowers. Agios Symeon can be found to the west. It contains a copy of a miraculous icon originally brought from Anafi. Residents of Anafiotika in typical Cycladic style rebuilt both of these churches in the 19th century. Many descendants of the original Anafi islanders still live in Anafiotika where today, only 45 houses remain in the area. However, it is slowly becoming a place for wealthy locals that are looking to own a cottage with an island feel in the big city. Anafiotika is a popular destination for tourists and serves as a nice escape from the busy city streets of Athens, but it hasn’t lost its charm to tourism yet. Very few restaurants or souvenir shops can be found in this tiny neighborhood. The neighborhood is at its busiest during high tourist season. 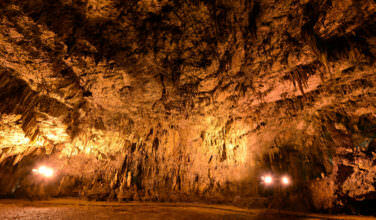 If you would prefer to have more space as you explore, it’s best to visit during the winter or early spring. Comfortable shoes are a must while wandering the streets of Anafiotika. The terrain is very uneven and can sometimes be slippery depending on weather conditions. Anafiotika is perfect for people looking to have an adventure and get lost in the scenery, since the streets don’t have names making maps or planning ahead somewhat useless.